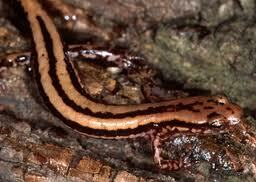 It’s Amphibian Tuesday and we’re going to meet a little salamander that lives just north of us. 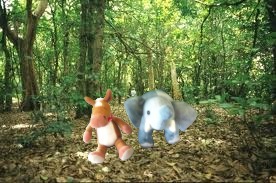 We’re going on a hike in the woods, so grab your backpack, walking stick and a hat and let’s head out on today’s adventure! 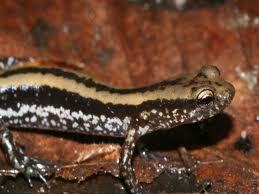 MEET THE THREE LINED SALAMANDER! Three lined salamanders have long slender bodies. Three lined salamanders also have very long tails. 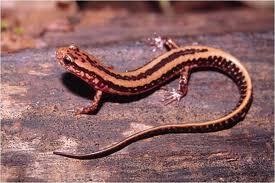 Three lined salamanders have dark stripes down their backs and sides. These little salamanders are adorable. We would love to spend a few days in the woods looking for amphibians of all kind. Did you know amphibians are a keystone species? They often help scientist determine the health of a habitat. If the amphibian population is healthy, then the habitat is probably pretty healthy too!